Product prices and availability are accurate as of 2019-04-12 01:20:56 EDT and are subject to change. Any price and availability information displayed on http://www.amazon.com/ at the time of purchase will apply to the purchase of this product. Enjoy a beautiful and delicious blend of heirloom lettuces including romaine, lollo rossa, green leaf, red leaf and more for a unique variety of colors and textures as pleasing to the palate as it is on the plate. For best results, direct seed as soon as soil can be worked. Sow every three weeks into the fall for a continuous harvest. Our gourmet lettuce blend can be harvested as baby leaf or grown as a full-size crop. For baby leaf, sow approximately 60 seeds per foot in 2" bands with about 1" between bands. For a full-sized crop, sow approximately 60 seeds per foot with a row spacing of about 1". Your lettuce should take between 7 and 10 days to germinate. It will be ready to harvest in just 28 days - even less if you've planted for baby leaf. Once fully grown and harvested, lettuce is the perfect base for any salad. Our unique lettuce blend adds more than just color and flavor, though: since all of our seeds are USDA Organic and Non GMO, they're as absolutely natural and healthy as it gets! 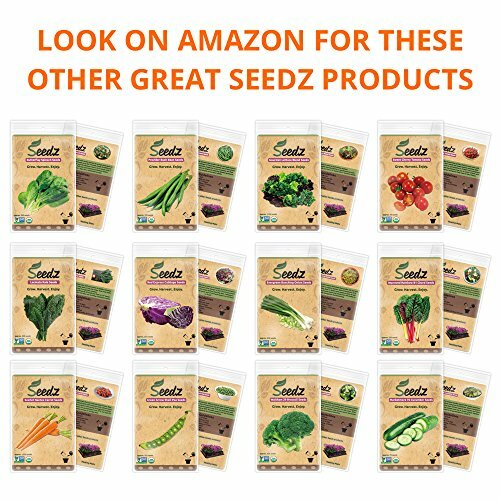 WHY Seedz ORGANIC LETTUCE SEEDS? 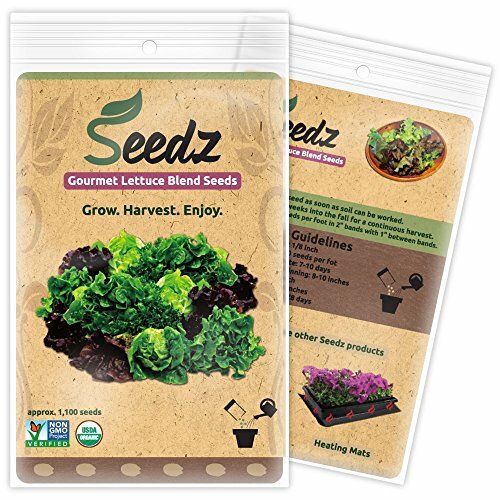 CERTIFIED ORGANIC SEEDS - USDA Organic lettuce seeds, garden seeds grown right here in the USA! 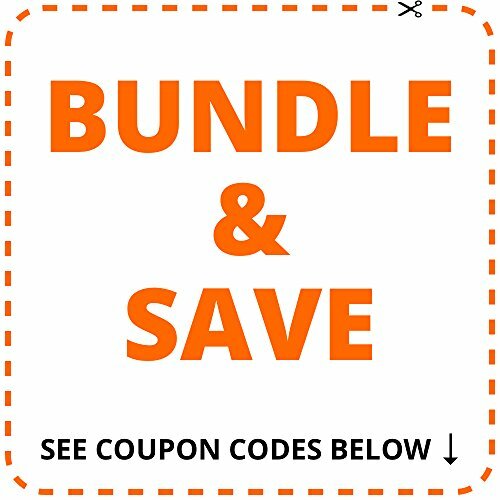 HEIRLOOM SEEDS - Heirloom vegetable seeds, Non GMO Verified; organic & pure heirloom lettuce seeds. BLEND - Approx. 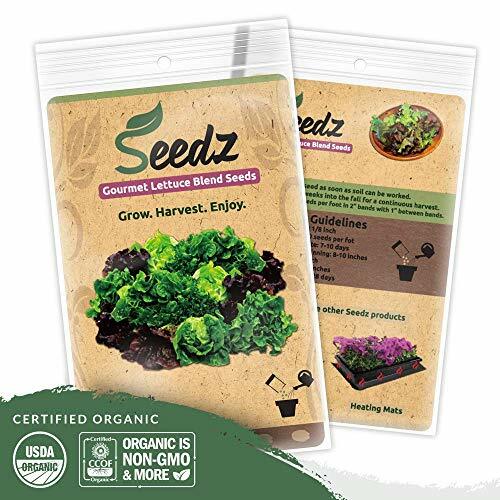 1,100 organic lettuce seeds incl. romaine, lollo rossa, green leaf, red leaf & more! 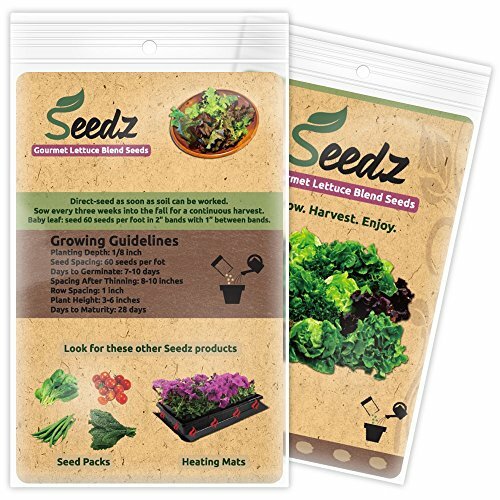 MORE FROM *SEEDZ* - Don't miss our beans, broccoli, bunching onions, carrots, cherry tomatoes, cucumbers, garden peas, Lacinato kale, red cabbage, spinach, swiss chard & more! RISK-FREE PURCHASE - Buy with confidence! You're covered by a No-Questions-Asked, 30-Day Guarantee.